September 22 is Independence Day in Mali. This national holiday commemorates the independence of Mali from France as the Republic of Mali in 1960. Mali is a landlocked country located in West Africa. It was colonized by France in 1892. The colony was known as French Sudan and was administered as part of the Federation of French West Africa. The French obtained firm control over the area by 1905. In 1958, French Sudan was renamed the Sudanese Republic and was granted complete internal autonomy, joining the French Community. In 1959, Senegal and the Sudanese Republic formed the Federation of Mali. On June 20, 1960, the Federation became fully independent from France. Two months later, Senegal withdrew from the Federation of Mali. On September 22, 1960, the former Sudanese Republic gained independence as the Republic of Mali. Former Prime Minister of the Mali Federation Modibo Keïta became the first President of Mali. Independence Day of Mali is widely celebrated across the country. The festivities include public speeches, wreath-laying ceremonies, parades, performances etc. The largest celebration is held in the capital city of Bamako. 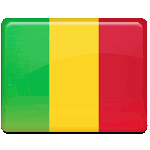 Independence Day is regarded as the national day of Mali.